The story of how the McCloud River Railroad developed a sattelite operation two thirds of the way across the continent started on 18 August 1890 when an entrepreneur named Edward Decker incorporated the first of several companies to hold the Ahnapee and Western name. The A&W started building north from a connection with the Green Bay & Western Railroad at Casco Junction, reaching the small port town of Ahnapee in 1892 and Sturgeon Bay in 1894. Ahnapee renamed itself Algoma in 1897, but the railroad retained the original name. Decker built the railroad primarily to augment and support his other business interests on the Door County penninsula, and when some of them failed the Green Bay & Western stepped in to buy the line. GB&W ownership lasted until 1947, when a group of local investors led by Vernon Bushman bought the line and reestablished the A&W as a local company. The railroad struggled on for another two decades, but by the late 1960s declining business and track conditions started taking their toll. The final straws hit in 1968, when the last major shipper in Sturgeon Bay closed down and inspectors condemned the railroad's ancient bridge across the Sturgeon Bay Ship Canal. The last freight rolled south from Sturgeon Bay on 4 september 1969, and the railroad received permission to abandon the line north of Algoma shortly thereafter. 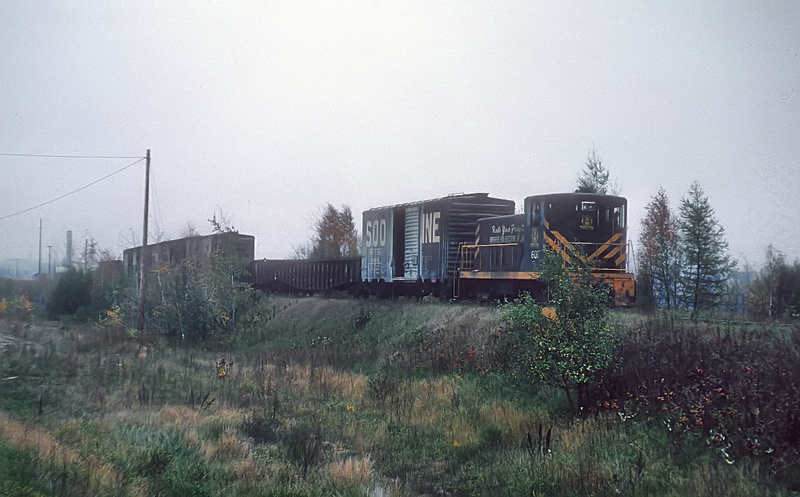 An AHW freight near Algomah on 19 October 1963. Rick Burn photograph, used with permission. One of the constants in A&W's history had been a moderate sized forest products plant in Algoma. The plant first opened in 1892 right as the railroad reached town, and operated under a succession of names leading up to the Algoma Plywood & Veneer Company. In 1940, United States Plywood Company purchased the plant, and it became the largest remaining shipper on the A&W after service to Sturgeon Bay ended. By this point, the A&W was in terrible shape, by physically and financially, and it was clear to all the line could not survive in its then form. U.S. Plywood, which had merged by this point into U.S. Plywood-Champion Papers, Inc (Ply-Champ), concluded the railroad was important enough to the continued operations of the Algoma plant that it decided to buy the railroad to preserve the service. One of the biggest obstacles to the sale was the A&W's accumulated debt, especially the $233,363.70 in unpaid car service and traffic balance debt the small road owed to over 50 railroads as of 31 March 1970. Negotiations between the parties progressed, and by the later months of 1970 they had a deal. Ply-Champ agreed to buy the A&W's operating rights and physcial assetts for $180,000 of their subordinated notes, with the money to be proportionally distributed amongst the car service and traffic balance creditors. All debts above that amount would remain the responsibility of the old A&W company. The Interstate Commerce Commission approved the deal on 2 November 1970, and Ply-Champ closed the purchase on 18 December 1970. For its money, U.S. Plywood got the 13.75 miles of the mainline between Algoma and Casco Junction, plus 2.64 miles of sidings and spurs; two General Electric 70-ton diesel electric switchers; one Flexi-van intermodal flatcar; and one old bay window caboose. Ply-Champ placed the A&W within the McCloud River Railroad's corporate structure, making it an operating division of McCloud instead of an independent subsidiary. The various top McCloud River company officers assumed the same positions on the A&W. 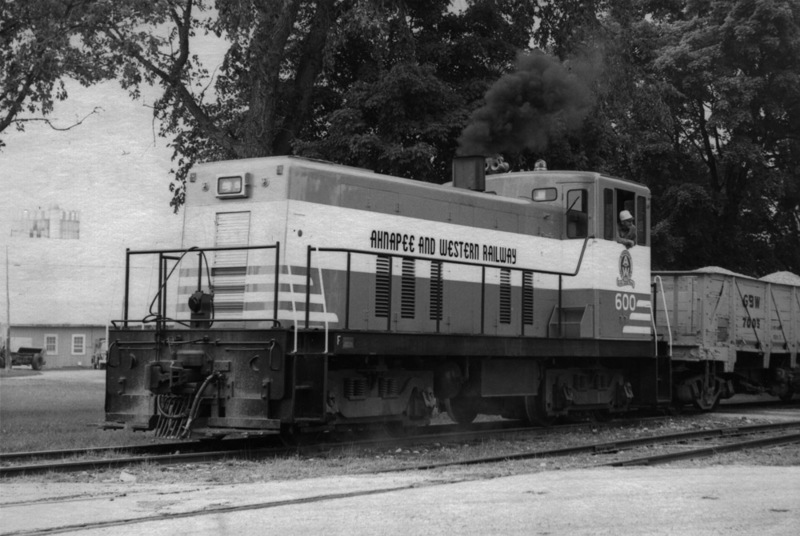 The new ownership almost immediately sent both of the diesels to the GB&W's shops in Green Bay for repainting into a variation of the orange and white worn by McCloud River's new SD38s. A&W #600 in Algoma in September 1971. Jeff Moore collection. The invoice for painting the #600. Jeff Moore collection. 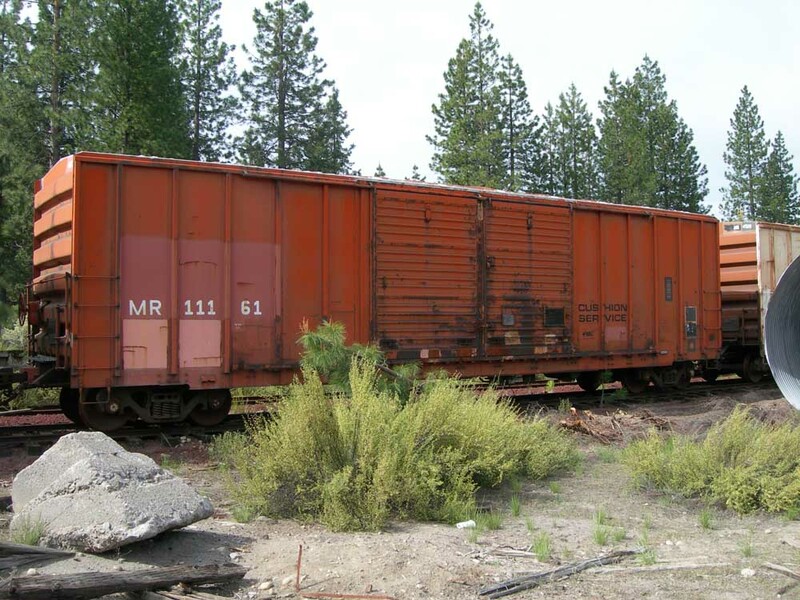 The A&W operated three trains a week over its line at the time it became part of the McCloud River. The new ownership decided almost immediately that the truncated operation required only one of the 70-tonners, and Ply-Champ transferred the second one to the Moscow, Camden & San Augustine, another subsidiary shortline railroad in Texas, almost before the new paint had even dried. The other diesel remained busy in Wisconsin. As noted, the A&W needed an end to end rebuild at the time Ply-Champ bought the line, and serious work to that end commenced in April 1971. The Green Bay & Western did most of the actual work on the project. Frank Stoller Construction Company provided most of the stone and gravel used. The A&W rented a backhoe and front end loader from the Alvin J. Tassoul Excavating Company, and the L.B. Foster Company provided a large number of angle bars. Lastly, the company called on the Krueger Construction Company for additional materials and equipment used in replacing two grade crossings in Algoma and rebuilding one side track. All told, Ply-Champ acting through the McCloud River invested $132,030.96 in rebuilding the A&W between April 1971 and June 1973. A&W #600 passing through Rio Creek on 11 August 1972. Note the GB&W ballast hopper right behind the locomotive. Tom Post photo, Jeff Moore collection. 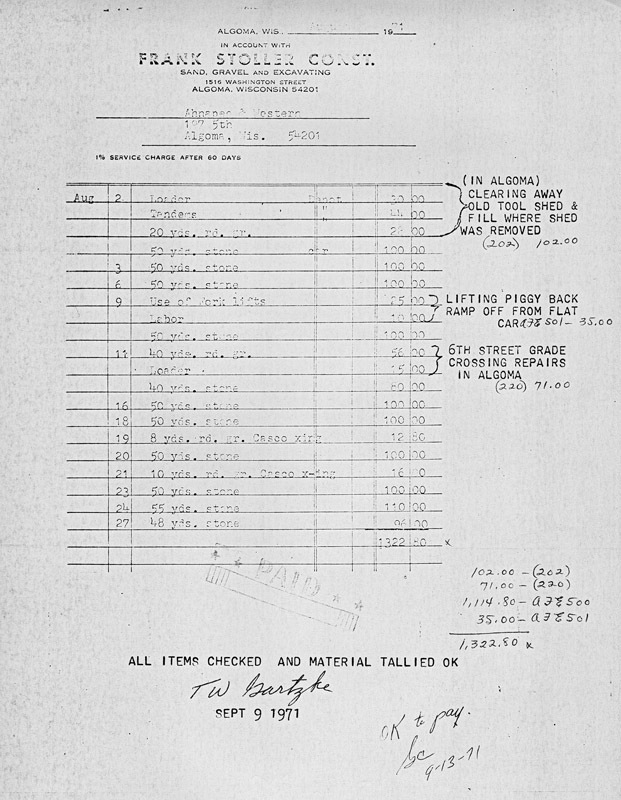 Invoice from Frank Stoller Construction for some of the rock used in the rebuild. Jeff Moore collection. 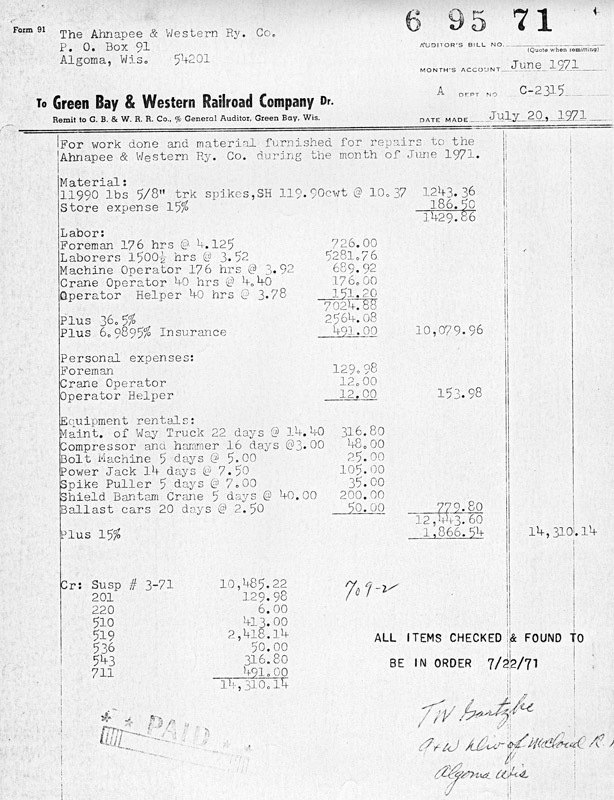 GB&W invoice for work done in June 1971. Jeff Moore collection. 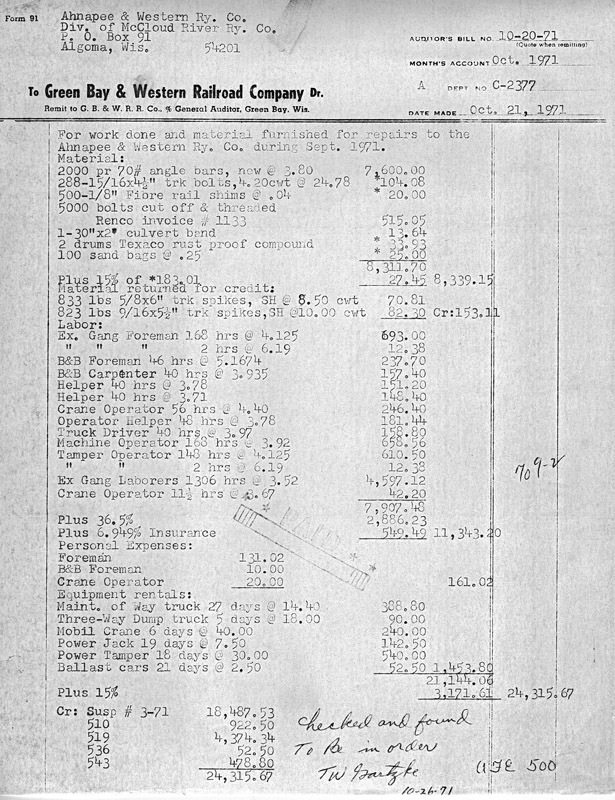 GB&W invoice for work done in September 1971. Jeff Moore collection. The agreements with the Green Bay & Western to rebuild the A&W apparently led to more serious discussions, as on 14 December 1971 the McCloud River signed an agreement with the GB&W for that road to take over operating the short line. Working through the various logistics associated with the deal stretched through 1972, and the A&W operated its last train as an independent road on 15 September 1972. The first GB&W freight ran up the line to Algoma on 19 September, and thereafter trains operating to and from that company's ferry slips at Kewaunee would make the side trip to Algoma as needed, usually two or three days each week. 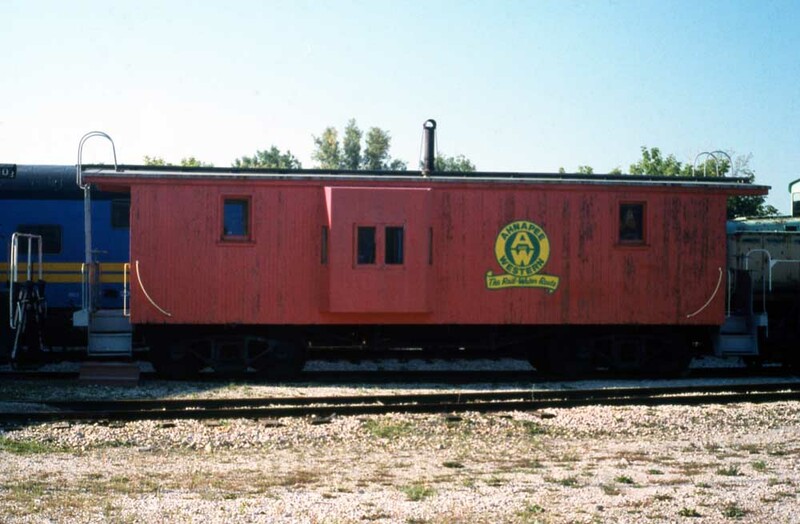 The A&W sold its remaining diesel and donated its caboose to the National Railroad Museum in Green Bay. The A&W thus lost its public face and identity, though the corporation remained part of the McCloud River Railroad. On 29 April 1976, the McCloud River reached an agreement with Trans Northern, Inc., allowing that company to operate passenger excursions out of Algoma. Trans-Northern brought in at least two passenger coaches and a succession of diesel locomotives to power the excursions, which operated as the Algoma Railroad in between GB&W's by now twice weekly freights. Ownership of the company passed from Ply-Champ successor Champion International to Itel Rail when the latter company purchased the McCloud River at the end of 1976; in a coincidental move, Champion International also sold the Algoma mill in the same year, to a local concern named Algoma Hardwoods. Itel incorporated the Ahnapee & Western Railway Company on 15 February 1978, though it remained a subsidiary of the McCloud River, and on 1 April the new parent started leasing some incentive per diem boxcars to the A&W. 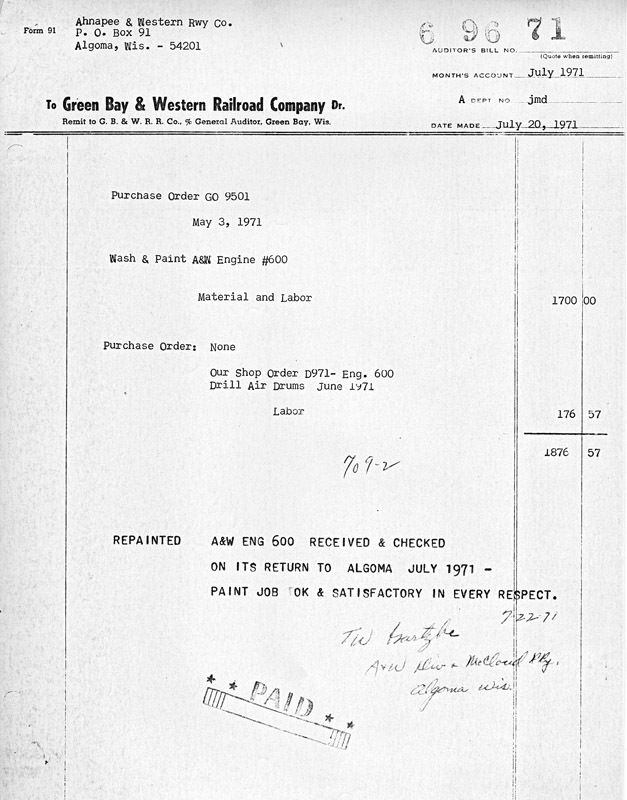 On 12 October 1978 the Interstate Commerce Commission approved Itel's acquisition of Green Bay & Western, and while various sources indicate ownership continued to rest with the McCloud River Itel replaced all of the McCloud officers from the A&W with GB&W people by late 1978 or early 1979. The increasingly infrequent GB&W freights again had the A&W to themselves after the Algoma Railroad failed in 1979. The railroad in the last years served two shippers, Algoma Hardwoods in Algoma and Bay Shipbuilding of Sturgeon Bay. The latter company shipped and received cars from a reload in Algoma. Continually declining track conditions caused operations to become increasingly slow and hazardous, and the GB&W operated its last train to Algoma on 25 March 1986. Bay Shipbuilding moved their reload from Algoma to Kewaunee, while Algoma Hardwoods commenced routing their rail traffic through GB&W warehouses in Green Bay. The GB&W issued a track bulletin taking the A&W out of service on 16 April 1986. The GB&W then used the line to store cars; however, shortly after operations ended heavy rains weakened the bridge over the Kewaunee River one mile north of Casco Junction, and a trackmobile gingerly shoved the last of the cars stored north of the bridge across it. GB&W continued to use the old interchange tracks at Casco Juntion and the first mile of the mainline for car storage. Another flood washed the bridge out completely on 25 June 1990 and caused some other damage to the line, and the GB&W operated a Jordan spreader up to the bridge to clear a mudslide and cut drainage ditches. However, by 25 October the A&W had been officially declared "No Longer a Common Carrier". Itel sold the A&W company, together with the Green Bay & Western and Fox River Valley railroads, to Wisconsin Central Railroad subsidiary Fox Valley & Western on 27 August 1993, and the A&W ceased its corporate existence on 19 November 1993. Scrappers finally removed the rails and other track materials from the line between September and October 1995, and the State of Wisconsin promptly converted the grade to the Ahnapee State Trail. The A&W did leave one other lasting legacy of its years under McCloud River ownership. The Moscow, Camden & San Augsutine relettered the former A&W 70-tonner, and then repainted its other equipment to match the "new" diesel. 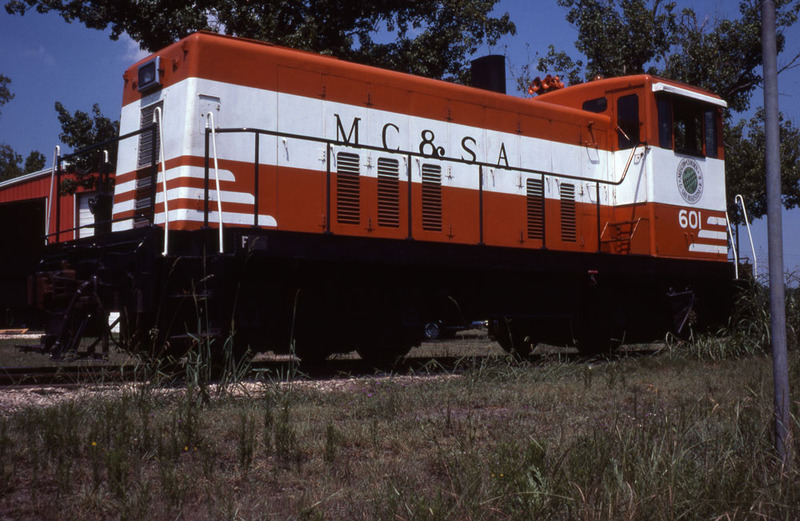 Though the 70-tonner is long gone, the road has continued to apply a simplified version of the McCloud River/A&W orange and white to its locomotives and other equipment ever since. The former A&W caboose on display in the National Railroad Museum in Green Bay. Jeff Moore collection. Moscow, Camden & San Augustine #601 in September 1977. G.J. Bolinsky photo, Jeff Moore collection. Locomotives- Only includes those A&W locomotives during McCloud River ownership. 600- GE 70-ton, c/n 31727, blt. 1/1953. 600 horsepower. Acquired new. Sold 11/1972 to Industrias Penoles, Mexico. Further disposition unrecorded. 601- GE 70-ton, c/n 31728, blt. 1/1953. 600 horsepower. Acquired new. Sold 7/1971 to Moscow, Camden & San Augustine #601, San Augustine, Texas; to Tex-Trax- Econorail Division #60, Port Arthur, Texas, 5/1984; Scrapped 2001. Trans Northern started their passenger excursion operations with a 1937- built 60-ton Ingersoll-Rand diesel, which suffered a fatal mechanical failure after a short period of time. Trans-Northern replaced it with two ex-Milwaukee Road Alco-built diesels, S-4 #818 and RSC-2 #988. Incentive Per Diem Boxcars- All cars in these groups wore a large "AHW" lettering to the left of the doors but had no other logos or lettering. #301-#400: Originally leased to Providence and Worcester; assigned 28 January 1980 to AHW. #2000-#2099 and #4000-#4099: Originally leased in 1975 from Itel to Hartford & Slocomb. Lease assigned 1 April 1978 to AHW. #5000-#5010; Leased to AHW 19 September 1983. Wrecks and lease terminations reduced the number of cars from 311 down to 45 by the early 1990s. At least 45 of the removed cars subsequently leased to McCloud River. In addition to his ownership of the A&W, Vern Bushman was also a long-time president of the National Railway Museum in Green Bay. 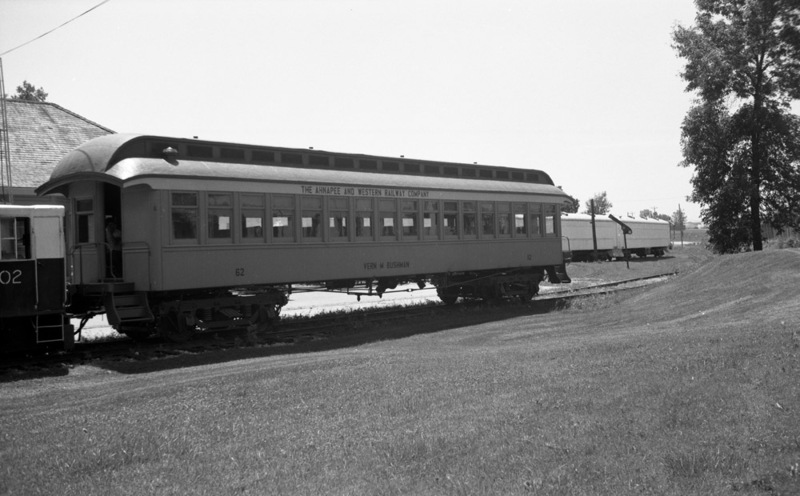 The museum painted this former Lake Superior & Ishpeming Railroad coach for Vern's railroad and named it in his honor, even though it had no other connection to the A&W. Jeff Moore collection. Special thanks to Mark Mathu and Andy Laurent for their help with some information on this page. Links to other websites of interest. Pages will open in a new window. Most are links to Mark Mathu's Green Bay Route website. 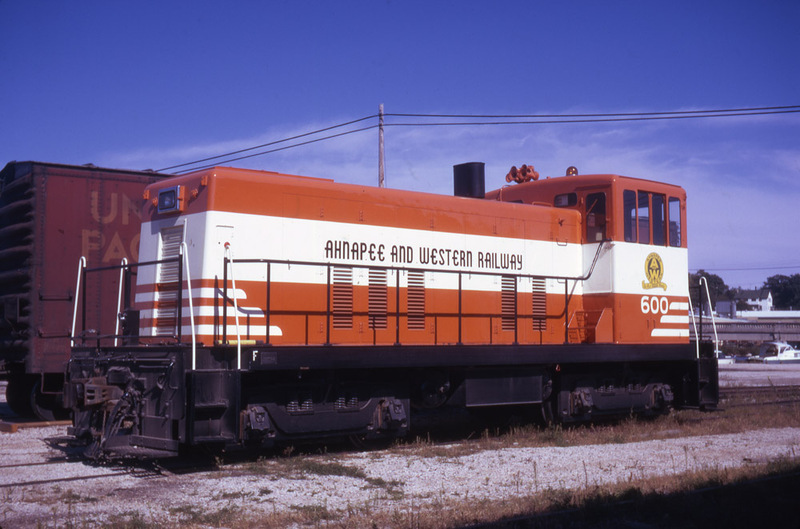 Ahnapee & Western's diesels before orange and white. Algoma Railroad excursions in Circa 1976 and 1978. Contemporary shots of the MC&SA showing the orange and white paint still in use.